The last of these is, in my opinion, the most important. Fact of the matter is that 9 time out of 10, internships are not Hollywood movie material no matter how badly we want them to be. Most of the time this is because we don’t have enough confidence in ourselves to ask for what we want and stand up for what is unfair (sorry, but it’s true). The news is often filled with intern horror stories, all revolving around employers who take advantage of this one fatal flaw. We’re just starting out in our careers as fashionistas and we’re working for those who are more talented and more experienced than ourselves. Grabbing their coffee and working overtime is just part of the job description. They have the right to tell us what to do, how to do it and when. This is a question I’ve been struggling with since my very first internship. Flash-forward one year, four internships, and one fluffed up resume later and I think I’ve figured out the answer. Although we should be grateful and respectful of our employers, managers, editors etc. we did not sell them our soul. We did not get into a contract with the devil (Miranda Priestly included) or agree for them to be our jailers. They are our mentors, our tutors and leaders; people we look up to but not people that should dictate our lives. Thankfully, nowadays internships are more regulated. No longer are they used as a way to procure free labour — internees have to get something out of it too, whether it be school credit or the possibility of a future job. This is something we interns often forget. We forget we have to be enjoying what we do, and we’re putting up with more work because we’re constantly told to make sacrifices now for rewards later on. Our predecessors worked their butts off to get to where they are, so we should be no different. But these are modern times. We don’t need to sacrifice our self-worth. There’s a reason you went through that extensive application process, spending hours refining your resume and outwitting all the other applicants. You got the job because you’re the best choice for it. You have experience no one else does, so make sure to use it. If the job description doesn’t match the job you’re doing, don’t be afraid to speak out. If you have ideas for improvement, tell them! Set work standards for yourself so you’re getting the most out of your internship. Before starting any internship read your contract thoroughly. Although employers want the best for you, they also want what’s best for them and sometimes the two ideals just don’t add up. Watch out for non-competition clauses and work hour requirements. Address these early on before they nip you in the bud. Whether it’s what to have for lunch during the staff meeting or a tip for solving a photo editing debacle, don’t be afraid to speak your mind. You may be an intern but your opinion is still valuable, and it’ll help with making sure you are remembered. If you’re more of an errand runner than an intern, express your concerns to a trusted supervisor. Chances are they’ll be more than willing to accommodate your needs. The point of an internship is get to experience and hopefully form some networking connections. If you feel that you’re not learning anything from the work you’re doing; once again, try speaking to your boss, and they’ll try to figure something out. If at the end of the day you feel hopelessly out of touch with the work you’re doing, or if the love you once had for your internship is slipping away, don’t feel like you have to continue. If your contract is seasonal try to stick it out but don’t feel pressured if you’re really unhappy. They may not be paying you, but time is money so be sure you’re making the most out of yours. 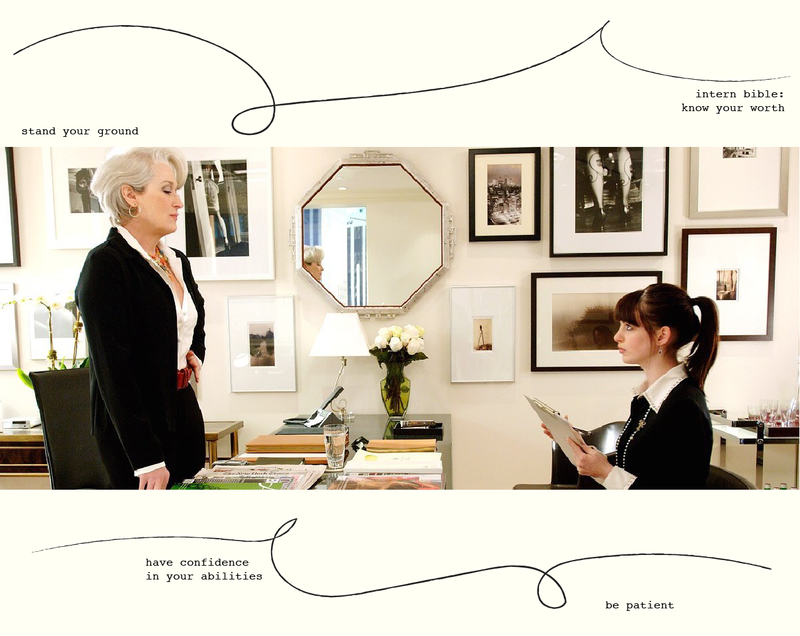 Unfortunately, we all don’t live in a world where Meryl Streep is your boss and you’re a fabulously determined Anne Hathaway. A world where no matter how hard you get knocked down you’ll always get back up without a speck of dirt on your French silk blouse. You won’t always know the difference between the bad guys and the good guys. As a young professional it’s sometimes hard to know when you’re overstepping your bounds, but as long as you’re making requests that seems reasonable you should feel proud that you’re making them! It’s important to start standing up for yourself now, because nobody wants to be part of another intern nightmare.